If you know me, you know I love love LOVE all things squash. I haven’t ventured down the spaghetti squash road for a long while so I figured, why not give it a whirl on this rainy, cold night! Pinterest is my bible. I use that site for inspiration for things I want to make down the road. I have pinned a number of spaghetti squash recipes, all of which are stuffed with something delicious. I had some of the squash mixture from the pizza leftover so I wanted to incorporate that into the mix somehow. I opened up a recipe from Tasteful Pantry & decided to see what I could do with Tasteful Pantry’s spaghetti squash lasagna as an outline. When I was cooking up the onions I added 4 heaping tablespoons of the pizza squash mixture (zucchini, yellow squash, butternut & red onions). It just added a little something extra that everyone enjoyed, but surely the recipe will be just as delicious without it! I also opted to add some spinach to the layering. I also love spinach & try to use it whenever possible. Honestly, the hardest thing about this recipe is cutting the spaghetti squash in half! If anyone knows an easy way to do this without nearly chopping off your entire hand, PLEASE let me know! Below is my adapted version of the recipe. I hope you all enjoy it as much as I did! Carefully cut the spaghetti squash in half & scrape the seeds out of the each half with a spoon and discard. Brush the inside of all 4 halves with a portion of the divided olive oil (1 TBSP should be enough for all 4 halves). Sprinkle with salt/pepper. Place in the oven for 30-50 minutes, until a fork easily goes through the squash. While the squash is roasting in the oven, cook the ground turkey until done & set aside. Use a large pan and heat the remaining olive oil (1 TBSP), over medium heat. Add the onion and cook until translucent. Add the chopped garlic & crushed red pepper flakes to cooked onions. Cook for about 1 minute or until fragrant. Next add the cooked ground turkey, crushed tomatoes, tomato paste, oregano, paprika, bay leaf, salt/pepper to taste & balsamic vinegar. Mix well & bring to a boil. Once mixture begins to boil, lower heat and bring mixture to a simmer until the squash is done cooking. Just before squash is cooked, add 1 TBSP of fresh basil to meat sauce & discard bay leaf. In a separate bowl mix together the ricotta cheese, 3/4 C of Italian blend cheese & 1 TSP of chopped fresh basil. Once squash is done cooking, remove from the oven & fluff up the inside of the squash slightly. 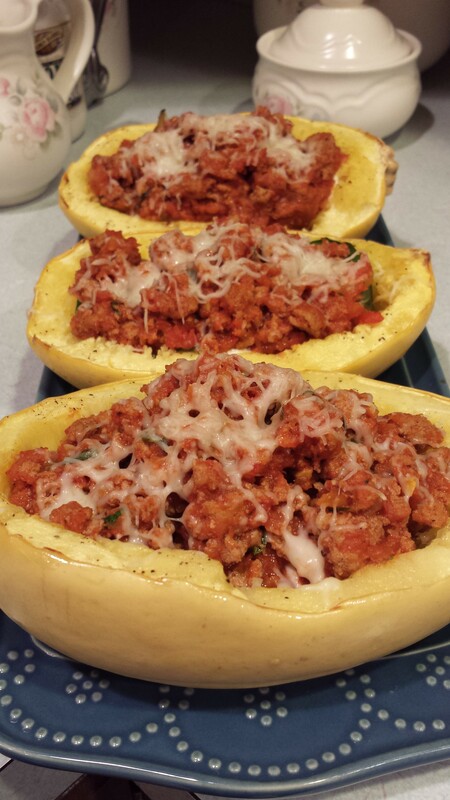 Place the spinach in the squash first, then cheese mixture topped with the meat sauce. Divide each portion evenly. Sprinkle the top of the meat sauce with a little cheese. Place in the oven for a few minutes until cheese is melted, about 5 minutes & ENJOY!